You really need to read this novelette. A novelette is a story with less than 20,000 words. The Only Harmless Great Thing (2018) is 17,200 words long. A novella is a written work with between 20,000 and 40,000 words, or less than 100 pages long. It is longer than a short story or novelette, which has less than 20,000 words, but not as long as an 80,000-word novel. The exact length of a novelette or novella is defined by periodical, publisher, and award guidelines. Historically, a novella was intended to educate the reader, moralize a social problem, or point out a satirical-worthy absurdity. With a novella’s less than 40,000-word length, a story can have multiple characters or concentrate on the journey of a single character. Short fiction, less than 40,000 words, works best when the story focuses on a character or characters’ emotional and personal development, and does not tackle a large-scale issue. The best novellas and novelettes have the character development of a novel with the fast pace of a short story. The Only Harmless Great Thing (2018) by Brooke Bolander is a novelette of such power and beauty, you should be a changed person after reading it. In less than 20,000 words Bolander rips out your heart, makes your jaw hurt, punches you in the gut, and in the end sob at the horror and beauty at the end of everything. If you are looking for a linear plot, item A -> item B -> item C ->, you will be very disappointed. Bolander moves among the multiple stories happening years, and millennia, apart, to come to the center story’s ending. The stories of our lives are not linear. What happened 20 years ago informs, and can dictate, the choice we make in the now. This is a story of stories. The novelette starts in the far future where all that is left of humanity is the story elephants’ Many Mothers carry among themselves of why they glow in the dark. All the stories the future elephants would tell are stories you read in the novelette. One story line is how the mythic female elephant Furmother-With-The-Cracked-Tusk, who had fur like a bear, rescued and released all stories into the world. In another story line Topsy the elephant and the stubborn, dying, Radium Girl named Regan originally from coal mine country tell us of the horror of being disposable in the early 20th century, and of righteous revenge that may end a bigger wrong. In another story line Kat is the scientist who comes up with the crazy idea to make elephants glow in the dark in order to warn future entities away from buried nuclear waste. She gets the job to sell the idea to the elephant Matriarch, and live with the guilt of the consequences. All the stories intertwine so that only by knowing what happened in the past, and in the future, what is presented when you the reader encounters it, makes sense. As a reader you will be juggling multiple, multicolored balls. Among the comments I have encountered concerning this book, and I would add my voice, is that how the males — human and elephant — torment the female characters and do what the males can to belittle, negate, and make the females disappear from the male’s world. Once females cost the men money or treasure, the females are discarded. If the men can make money and find entertainment as part of the disappearing, all the better. This story is a fable of sorts. Treat all with dignity and kindness, or it will end badly for you. We are the stories we tell ourselves. Bolander has the future Many Mothers explain this in the very beginning of The Only Harmless Great Thing. Without the stories our ego tells ourselves, how would we, individually and collectively, know who we were? Why are you where you are? Without your resentments, who are you? Is the moon made of Furmother-With-The-Cracked-Tusk’s tusk that was blasted into the sky when the stories inside her exploded, is it a wheel of European cheese, or the home of a goddess who refuses to speak to her brother? What is the story behind you wearing blue jeans, khaki pants, or a sarong? Who would the collective we be if we told stories where we in our reality-to-come acted with kindness? The Only Harmless Great Thing (2018) is available online in digital and paper forms. You can also request a hard copy through your local bookseller. “May I go and help carry the things to the poor little children?” asked Beth, eagerly. 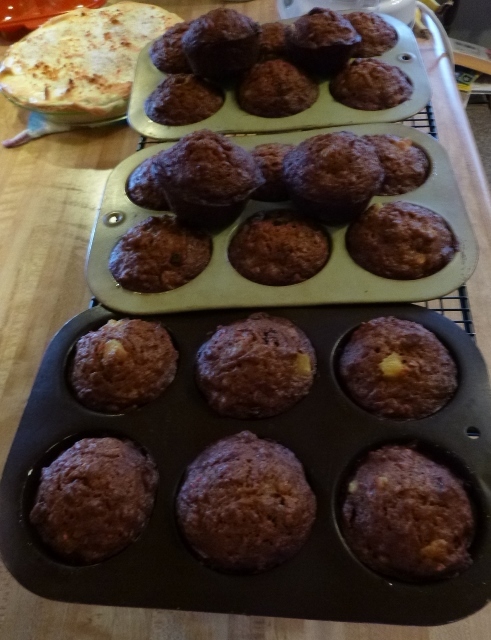 For several years I was making muffins all the time. It was not the muffin fad that came and, for the most part went in the last ten years, but Beth Hensperger’s “The Best Quick Breads” (2000) cookbook I think I acquired through an art-and-craft book club. I enjoy quick breads, but storing and freezing muffins is an easier way of eating quick bread when you live on your own alone. I found no mention of the word “muffin” or “crumpet” or any alternate spellings in Samuel Johnson’s 1785 Dictionary of the English Language. An English muffin, also called Yorkshire muffin, or rock bread is a yeast bread cooked on a griddle in the kitchen, or a flat rock over hot embers. Documentation of English muffins goes back the 13th century. According to etymonline.com the word “muffin” first made an appearance in 1703. “Crumpet” can be found in written use in the 1690s. Jane Austin would have known what a muffin or crumpet was, but it may not have been socially acceptable for her, or her characters, to consume such a working class food. I have not studied Austin’s letters or other writing to know either way. Muffin men were 17th century through early 20th century English street food vendors who cooked the bread on griddles fresh for their customers. So, the food trucks that specialize in modern muffins and oven-fresh cookies are continuing a culinary tradition possibly dating back to the time of England’s Elizabeth I. Recipes for what Americans, coffee house, and muffin enthusiasts would recognize as a “muffin” possibly first appeared in the USA’s very first cookbook “American Cookery” (1796) by Amelia Simmons. Simmons’ “American Cookery” was the first to include as an ingredient a very refined potash or pearlash, a native-to-North America alkali leavening agent. Through the generation of carbon dioxide while baking, including pearlash caused the bread to rise as seen with modern baking powder. This was the birth of the modern quick bread. Identifiable muffin recipes appeared in US cookbooks in the early 19th century along with the entry of muffin pans into the marketplace and kitchen. The recent muffin fad was not the first muffin fad. When I was little in the 1980s there was a muffin recipe that was all the rage. When we visited my aunt in the Kansas City area (Kansas side) she made Morning Glory Muffins which she loved. The recipe came from Nantucket Island which in the Midwestern imagination was the playground of the rich and famous. When I was ten years old I did not appreciate what a Morning Glory Muffin was or what it represented to the larger American culture. From what I have been able to find, Morning Glory Muffins were first put together by Chef Pam McKinstry in 1978 for her Morning Glory Café on Nantucket Island, a 3-by-15 mile long island about 30 miles off of the coast of Massachusetts. The original Morning Glory Muffin recipe appeared in Gourmet magazine in the reader submitted recipe section in 1981. Appearing in the reader submitted recipe section of Gourmet was like winning an Olympic gold medal. The muffin recipe ‘went viral’ by 1981 standards. In 1991 the recipe was selected by readers as one of Gourmet’s twenty-five favorite recipes published in the previous fifty years (1940-1990 or 1941-1991). The Morning Glory Muffin is a catch-all recipe that uses lots of odds and ends that can be found in a busy bakery and café. The crushed pineapple, two cups grated carrots, grated apple, raisins, shredded coconut, and pecans are all in amounts that look like to me Chef McKinstry had enough to make something, but not enough of any one ingredient, except maybe carrots, to make anything in particular. The results are wonderful, rich, sweet, and freezes well muffins. This is a very easy muffin recipe. You spend more time grating and chopping the ingredients than you do mixing. Use canola oil as directed or another flavorless cooking oil. A more forward flavor cooking oil will negatively interact with the oils in the nuts and other botanical compounds in all the fruit and vegetable ingredients. I would strongly recommend hand mixing in a large glass mixing bowl. The batter is thick and heavy. A hand-held electric mixer would be overwhelmed by the heaviness of the batter. A hand-held electric mixer works great to mix and aerate the liquid ingredients, mixing the eggs and oil until almost double in volume. With a stand mixer it would be very easy to overmix the combined dry ingredients and wet ingredients. Overmixing is a danger when making quick breads. Overmixed quick bread is heavy because the gluten in the flour activated while mixing and the bread does not raise while baking. Add the wet ingredients to the dry ingredients and hand stir until the mixture is just combined, and the flour only just moist. Gently spoon the batter into paper-lined or well-greased muffin pan cups. Place in hot 350°F (176.7°C) oven and leave the door closed for thirty minutes. No Peaking (Mother!Jamie!Dad!Sam!). The muffins are done when the tester comes out clean after being inserted into the baked muffin. Morning Glory Muffins made from the original recipe by Chef Pam McKinstry. The muffins would be good for a Sunday or holiday brunch. They really do need to sit for at least overnight to reach their best flavor and texture. Make the evening before the brunch or breakfast and allow to sit overnight in a storage container. Butter spreads well with the muffins as well as plain cream cheese. These muffins freeze extremely well for up to two months. A muffin reheated after frozen for longer than two months is not as tasty. The Morning Glory Muffin recipe has been around almost forty years. It has become a dependable recipe for me. For a little bit of work you can get a great result. 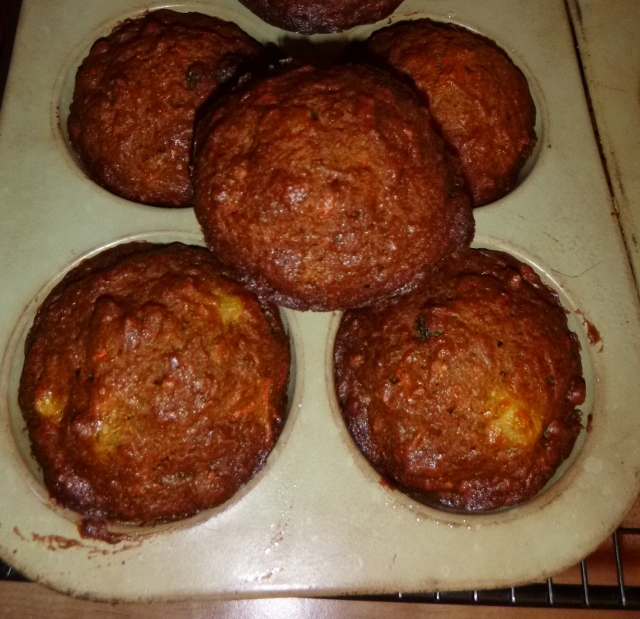 Below is a link to Pam McKinstry’s original Morning Glory Muffin recipe, via Earthbound Farms’ website. I have, yet, to find a copy of the original 1981 Gourmet magazine. I will keep looking. Below is more information about “American Cookery” (1796) by Amelia Simmons. I have read repeatedly that “American Cookery” was the first American cookbook written by an American for Americans. The Spanish settlers arrived in the Western North America as early as the 1530s so I am not comfortable making that claim until I have proof the Spanish settlers and Catholic missionaries were not writing cookbooks for their American mission settlements on how to use local ingredients, too. If you like “Little Women” by Louisa May Alcott or have not read it before, you can download a free e-book. Please, feel free to leave a donation for the Gutanburg.org efforts. There are other free copies of “Little Women” available online. Or, you can support your favorite local bookstore and purchase a hard copy. Or, you can visit your public library and practice your social skills with the librarian behind the circulation desk. Mark Twain’s Notebooks and Journals are available through Google Books.